Cities offer both opportunities and challenges for large data centers as land is valuable in metropolitan areas due to scarcity. There is no such thing as “free cooling” whatever our competitors say. If you vent your heat into the atmosphere you contribute to global warming and we all pay. 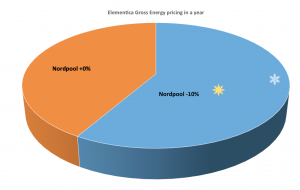 A data center’s heat represents a significant economic value: the expected value of a 10 MW 15 year Open District Heating contract is 23 Million Euro (in real terms) and Stockholm is a prime location for this new breed of data centers. Cities have high geographic density and agglomeration is associated with externalities. Data centers need to be of high-density and exploit the positive synergies to offset the high cost of land. We cool our data centers with heat pumps and sell the excess heat to the district heating network, so we can lower your electricity bill. At times we can also sell surplus cooling capacity to the district cooling network (when the weather permits). Due to fixed installations we can offer long term and transparent contracts, up to 15 years. Our local energy partner Fortum has already invested in the connection to the distribution system. Fortum Värme has created a market place for recovered heat and production capacity, giving us the opportunity to offer long-term transparent contracts and open prices for trade in excess heat and cooling. Large as well as small companies and businesses can join the scheme. Elementica’s parent company Bahnhof already operates three separate data centers proving our concept and technologies for heat re-use work. Our data centers look as good inside as outside, always offering a clear overview of operations. The above photos show a few of our current installations. Our parent company Bahnhof can draw from 20+ years of experience of delivering ISP-grade level internet access and data center capacity, all the while powering near-by households thanks to the excess heat our customers generate in our facilities. Simple overview of an installation of a Bahnhof/Elementica heat re-use system. The project, originally named Project Green Hub, is a joint venture between Bahnhof and the local energy provider Fortum Värme. The facility will feature high density infrastructure customized for heat recovery with 110kV feeds directly from a new regional distribution station, with onsite 10kV gen-sets. Elementica features fully redundant 2N cooling system, leveraging both heat recovery and cost-effective cooling from the near-by harbors sea water and promises to provide exceptional OPEX savings through sales of heat. How do we optimize cooling systems for heat recovery? We use specialized ultra high efficiency fan coils with variable speed EC-fans capable of individual cabinet loads exceeding 25kW (average 13kW per cabinet). The power to sqm-density is 7.35+kW/sqm, fully compatible with commodity hardware. Our solution requires no special server or storage system or liquid cooling. The secret is to have high chilled water temperatures (<20C) while adhering to the ASHRAE standards on the air side. In addition we utilize redundant cooling systems based on existing sea water tunnels. 2N cooling production by heat recovery (during cold 7 months) and sea water (during warm 5 months) provides great redundancy, sustainability and cost benefits compared to market alternatives. We source only 100% carbon-free power, still offering a long term power pricing that is very attractive. In combination with 97% energy reuse our sustainability advantage is impossible to match. Trends in ASHRAE-standards will improve OPEX as chilled water temperatures get closer and closer to District heating temperatures, thus improving heat pump COP. Increased density will offer a lower margin cost, as opposed to current pricing models – this, we believe, will attract customers with real high density loads. Large benefits can be achieved through heat recovery from large data centers in a city with heating needs. Cooling with water is scalable, efficient and a basis for future-proof data center designs. Stockholm offers a unique opportunity for large scale heat recovery and cost-effective cooling based on the existing district heating and district cooling networks. We’ll update these pages with new developments and more info on how we aim to construct the world’s most energy-efficient data center yet, until then go read more on how Elementica integrates into the local infrastructure and community.